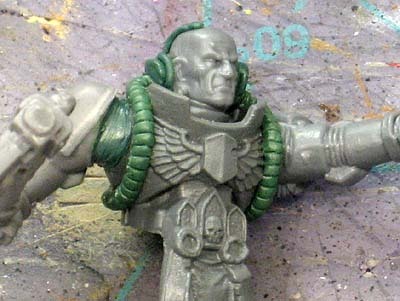 I do this all the time and I figured I would do a little step by step to show just how easy it is to "change" the position of space marine arms. 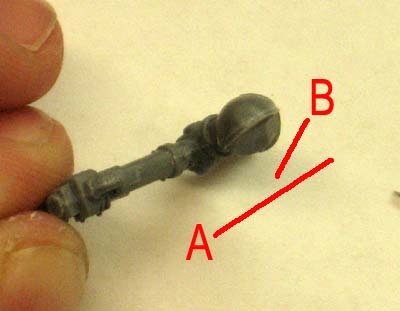 With some modification to the steps, you could do this for any model actually. The first step is too figure out the angle you want the arm to be positioned at. The arm as is, would be at the angle "A" but I want it to be a little more open and away from the body so I cut my own angle "B" to use when I glue the arm to the torso. I only cut away what I have to. Too much and the arm will look odd because you are cutting away at the shoulder joint. Next is to dry fit your arm to test the angle and then glue it in place once you have what you want. 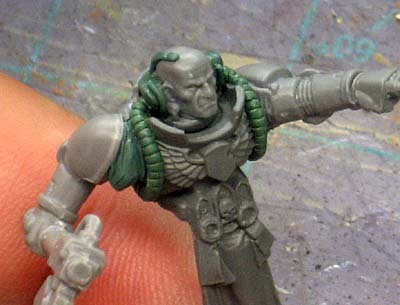 You can see the new angle leaves quite a gap on the front of the model at the shoulder joint. Time to fill the joint. 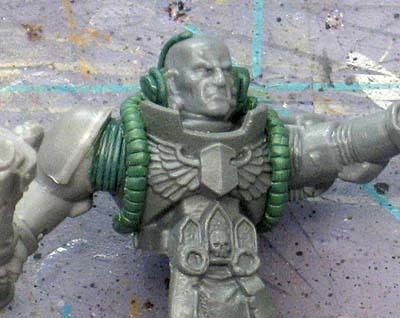 Taking a bit of greenstuff, I start working at the top of the shoulder and move down to the bottom. I try and leave a little "lip" along the edges to help define the difference between the flex fitting and the armour plates. 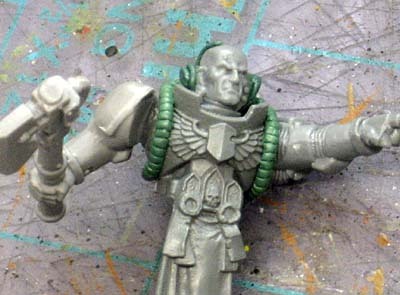 I use my X-Acto for this since it has a tiny point and I can get it up into the very top of the shoulder joint. As you work towards the bottom, you inevitably end up with excess that you can cut away. Make sure you get it super smooth at this point, any surface imperfections will be seen in the end and make the texture you add in the next step look "wrong" if you don't smooth it out to begin with. Time to add the texture. Using my X-Acto blade again because I can cut a fine indentation, I go back and add a series of parallel "folds" in the joint. This should mimic the joint material visible in the other joints. Make sure to make the folds in this joint the same width as the other joints in order to keep the illusion convincing. Make them too big and they look wrong. Make them the same size as his other arm and people won't even notice you made the change. That Librarian is looking great indeed.